A former resident of Mapperley, who played a great part in the life of Mapperley for 61 years, is Mr Charles Hill, who retired from Mapperley Farm recently, and now lives just over the border in West Hallam. At 85 years of age, Mr Hill has no wish to vegetate, and he takes regular walks to his old Mapperley haunts, for the benefit of his health and to make sure he does not lose touch with old friends. A widower for three years, he looks forward to his weekly visit to Derby Market and the annual journey to the Royal Show is an event he would not like to miss! It was almost by chance he became a farmer, having served an apprenticeship with a cabinet-maker but, on the closing of the business, he opted for farming a decision he never regretted. Mr Hill's time is still fully occupied, although the attendant worries of farming are absent. An avid reader, he keeps up to date with the latest agricultural procedures, and the large billiard table in the lounge indicates his favourite indoor game. His son-in-law and daughter, Mr and Mrs Dennis Gilman, who live nearby, ensure that he is never lonely. The story of Mapperley would not be complete without mention of Mr and Mrs W F Hooper and their Langdon herd of goats. Their hobby, which began with one ordinary goat for the beneficial qualities of its milk, has developed during the past five years into an absorbing venture, with prize-winning stock to which the award of cups and rosettes has become a habit at the shows in various parts of the country in which they have been entered. There are not many villages today without a shop, and Mapperley has two. The post office and general store has been in the hands of Mr Arthur Shooter and his wife Sylvia for the past ten years. From its well-stocked shelves almost anything asked for, from an iced lolly to a hot-water bottle, can be produced in a moment. A few paces away is a smaller, yet equally well arranged shop, formerly owned by the late Mr Oswald Howitt, for nearly forty years. The village has an adequate bus service to Ilkeston, and a walk to Mapperley crossroads at West Hallam finds a good service between Ilkeston and Derby. Twice weekly, members of a group of doctors hold surgery at one of the houses in the village, and messages and calls for the convenience of patients, are dealt with speedily and efficiently. Mapperley seems to have everything, and its residents, young and older, appear to have discovered the right balance for happy communal living: not too closely knit to be insular in their outlook, yet not too deeply transformed by the changing pattern of life today as to be completely oblivious of the strong ties of family and work which bound everyone so closely together in past years. Smalley Lodge article, photographs and information very kindly submitted by Shirley Pegg of West Hallam. 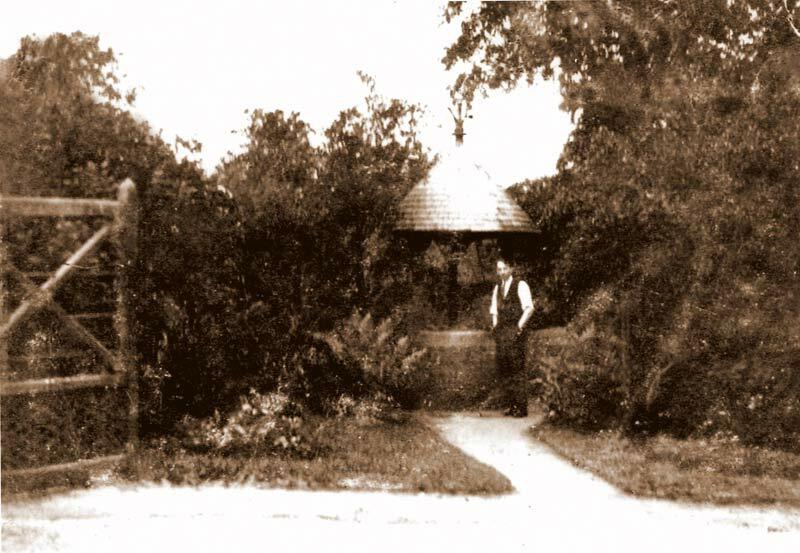 The man standing by the well at Smalley Lodge is Mr Frederick Gerrard (1864 - 1943). He was a gardener for the Miller-Mundy family and resided with his family at Smalley Lodge which was on the edge of the Shipley estate. Shirley Pegg was Frederick Gerrards grand-daughter. He lived there from 1900 to 1937. Frederick moved to the Lodge after leaving Alton Towers where he worked in the gardens. Shirley's father Charles was born at the Lodge in 1913, leaving when he married Mary Elizabeth Parker Scott. Shirley's uncle Tom was also born at the lodge in 1910. He very sadly took his own life in 1933 aged just 23 years. Tom can be seen on the Cecil Raikes locomotive - see History section, Cecil Raikes Locomotive Charles Gerrard was a local builder. 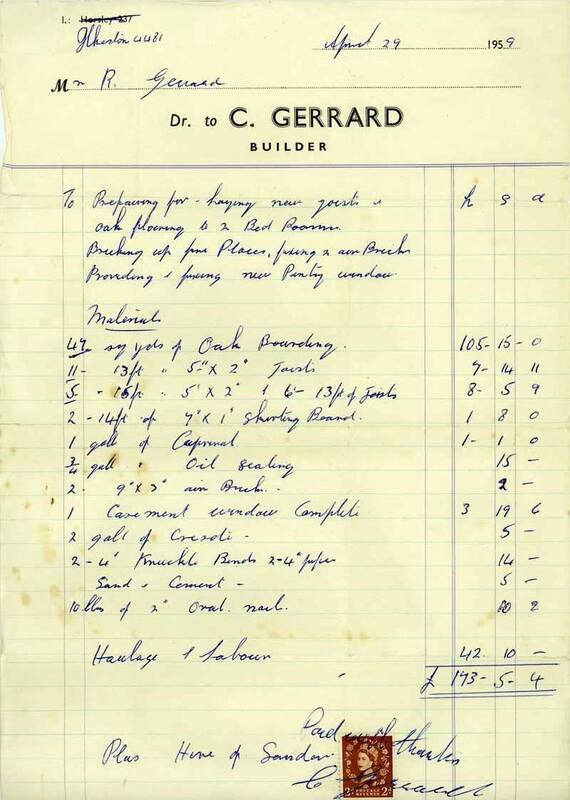 Below is a copy invoice from 1959. 47 square yards of oak boarding for £105! 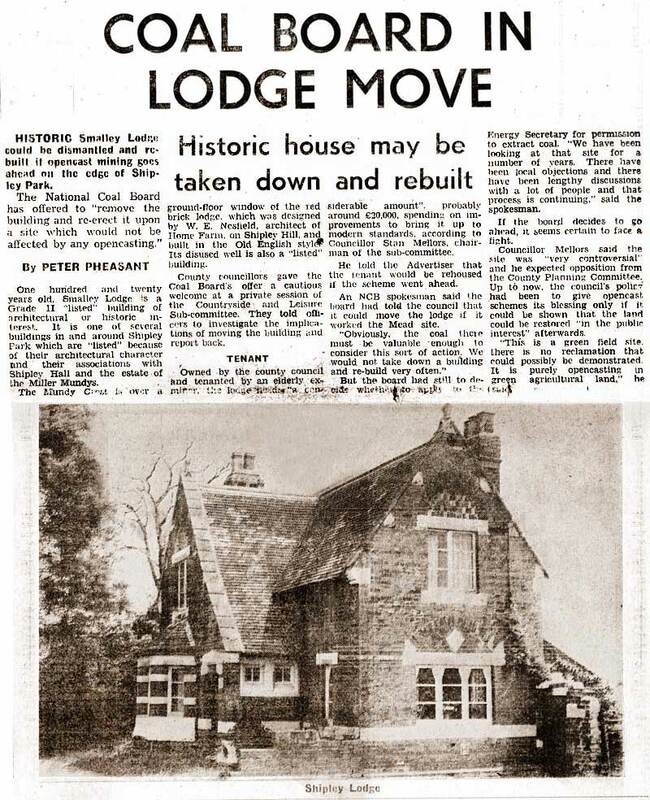 The Lodge was then taken over by the Skelton family in 1937. 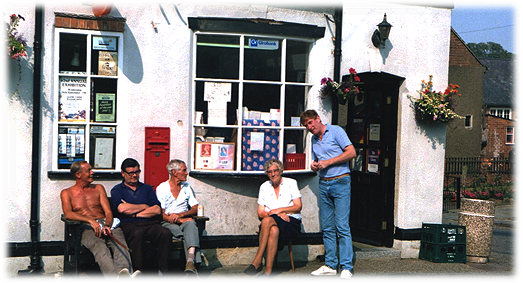 A group of villagers and visitors chatting outside the central shop and post office. Date unknown but circa 1990. Joan and Ed Hubbard who had the shop from 1977 to 1987 still live in Mapperley. Alice McGill and Aubrey Marsden. The same millwright probably built the Mapperley post mill of the same design as Dale in 1788. It stood 250 yards east of the present church at SK 437 429. On September 22nd 1847 it was advertised for sale in the Derby Mercury. "The sale of Mapperley Windmill. By auction at Mapperley, a wind corn mill with drying kiln. Late of Mr T. Martin (deceased)". This sale was unsuccessful and the windmill remained with the family. Again it was offered for sale on October 30th 1849. Being offered for sale by auction at the Punch Bowl Inn West Hallam. The wind corn mill, a butchers shop and five fields were offered. Giving commanding extensive views of the surrounding country. This abounds with coal and ironstone of the richest description. This sale again failed and Francis Martin remained the owner until 1862. When again he offered the property for sale on December 4th 1862. Complete with well built farm-house with barn, stables, cowhouses, butchers shop, having a frontage of 78 feet to Town Street, and a frontage of 93 feet to a certain other street or road. Mr Parkin was the Estate Agent and surveyor of Idridgehay. (He was also the agent of Francis Newdigate of West Hallam). But Francis Martin was still operating the mill in 1864. By 1876 John Pounder had bought the farm and windmill. But the mill was soon abandoned. 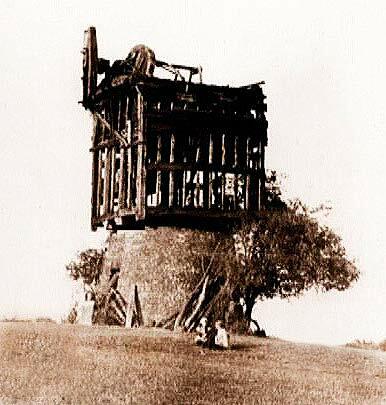 In 1880 it was known by the villages as the "Ode Windmill on the Hill". The Pounder family continued farming and running the butchers shop. With Harry and William Pounder taking over the family business by 1895. When dismantling the mill many parts were saved and sent for spares for the Dale Windmill. Local artist Gladys Turton produced a painting of the mill in 1920. Another artist, Karl Wood born in 1888, became so fascinated with windmills that between 1931 1940 he undertook the task of drawing every standing mill in the country. This included 21 in Derbyshire. 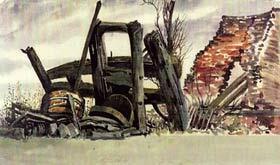 His sketches and paintings can be viewed in the Lincolnshire Museum of Art. His Mapperley work was produced on April 11 1932. I wonder, if any of you, like me, think, of windmills as romantic, mysterious places. Some years ago there was an exhibition of photos of windmills in Derbyshire. It was then that I had my first sight of a photograph of Mapperley windmill. It was very disappointing to see it, as it showed an old ruined building that had been burnt. I had no idea of where the mill must have stood but in the book that I bought it stated that it had stood about 200 yards to the east of the church on a ridge overlooking the village. With a group of children from Mapperley School I set out to discover if anything remained of the old mill. To our great disappointment not one sign remained in the field. Not one stone to show that there had ever been a windmill in Mapperley village. Of course this is like so many other places where windmills once stood and we have to look at old maps now to see where a lot of them stood. We are very lucky actually to have a windmill at Dale Abbey complete with sails, because Mapperley windmill must have looked exactly like it. In fact four local mills were so alike that it is believed that the same millwright built them. They are Dale Abbey, Mapperley, West Hallam, and a windmill on Derby Road, Ilkeston. There are very, very few working mills now, but there are some and it is most interesting to visit a working mill and go inside to see the machinery involved in producing; flour and also nice to buy some stone ground flour if you like baking bread. In the Derby Mercury paper, in 1847, Mapperley windmill was advertised for sale. Thomas Martin (a well known name in old Mapperley) was the miller until his death just before that date. It is thought that his two sons carried on working the mill. It was for sale once again in 1862, being advertised once again in the Derby Mercury as a freehold estate in occupation of Francis Martin. The sale was of the windmill, five fields, a drying kiln and a farmhouse among other things. In fact the miller was a very important person in the village, along with the Lord of the manor and the parson. The miller took a toll of all the villagers, who had to bring corn along to his mill for it to be ground. He must have been quite a wealthy man. Karl Wood, who lived in Lincolnshire, was an art teacher and painter who must have been fascinated by windmills because he drew sketches and did paintings of a great many of them, more than 1300 in fact. He must have spent a lot of the school holidays going round sketching them. I hope this will arouse your interest, not only in Mapperley windmill, but also in the other old buildings in the village. I have just seen Joan Law's piece on the Mill. The last few remains were removed when I was still at Mapperley school i.e before 1948 when the open cast mining took place on that side of the village. Gaffer Johnson (head teacher) thought that they should be preserved, but they were quickly destroyed. I don't remember much about the the mill, I think that I can remember seeing it, but not how much was there, but do remember his anger when he discovered that they were gone. Again, perhaps someone else could add to this. England had over 25,000 windmills by the early 1800’s. Our local Derbyshire villages Mapperley, Shipley, West Hallam and Dale all had working mills.